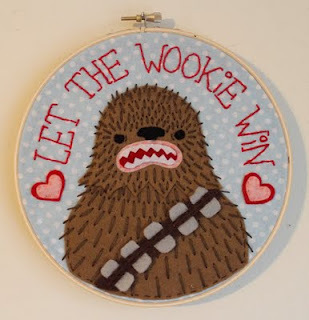 Who doesn't love Star Wars and cute stitching? Over on Craftster, Love and a Sandwich created these adorable Star War Hoops. I am just dying over them! She is so talented and I loved learning more about these pieces and about her. I made four embroidery & applique pieces featuring the fuzziest creatures from the Star Wars movies! 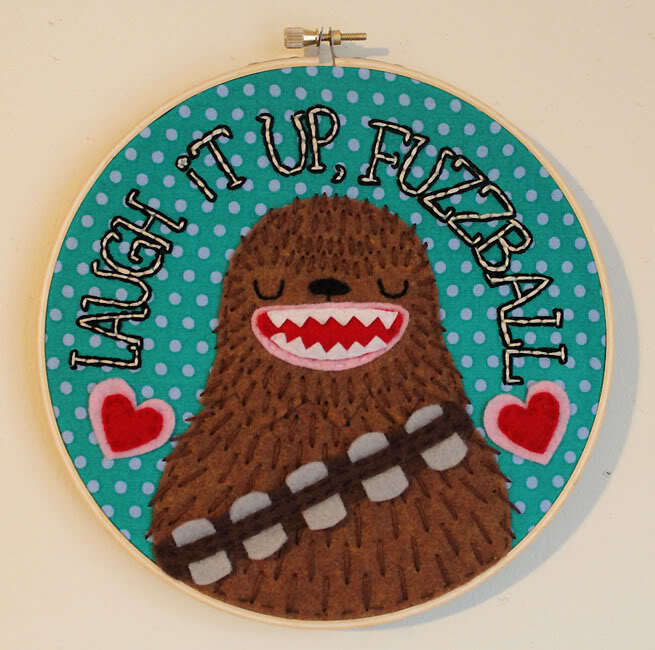 Two Chewbacca pieces featuring quotes from Han Solo about him. My favorite duo An Ewok just hangin' out on the Forest Moon of Endor, and then a Wampa right after its arm has been cut off, and not looking too happy about it I made these for a Star Wars themed show. My real name is Chelsea Bloxsom but I go behind the name Love & a Sandwich when posting my work. I live in Boston, MA and work from home alongside my concept artist boyfriend and two fantastic pups! 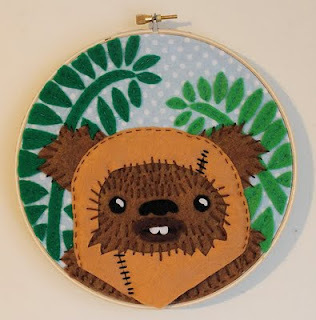 I normally make furry plush monsters, but recently I've been really into appliqueing & embroidering on hoops. Anything/anyone with a great imagination! Studio Ghibli movies, Tim Burton movies (the old ones), and too many fantasy/action movies to list! Some artists that inspire me that also sew are Lana Crooks, Felt Mistress, A Little Stranger, Victor Huang, Becky Gould, and Steff Bomb. All amazing people with totally unique styles. What are you working on now? Do you have plans for a future project? 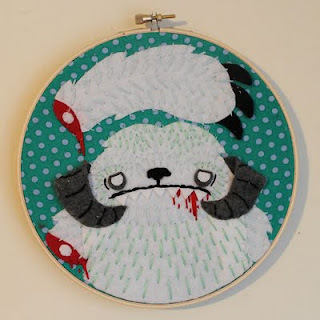 Right at this very moment I am working on a Ludo (from the movie Labyrinth) embroidery & applique! I have plans for many more, mostly of my favorite fuzzy creatures from movies/tv. What would you tell someone who wants to work with felt? Is it hard? These are fantastic! I'm totally in love with them. I hope you post the "Ludo" one when you are finished. That is one of my all time favorite movies. :) Great work! Yay!! I loved seeing these on Craftster and I'm so happy to see them here. I'm a huge fan of applique/embroidery!! These are pretty adorable. I love the style, and they look amazing together, but I feel like I have to point out that "Wookiee" has 2 Es. thanks for sharing, its amazing!